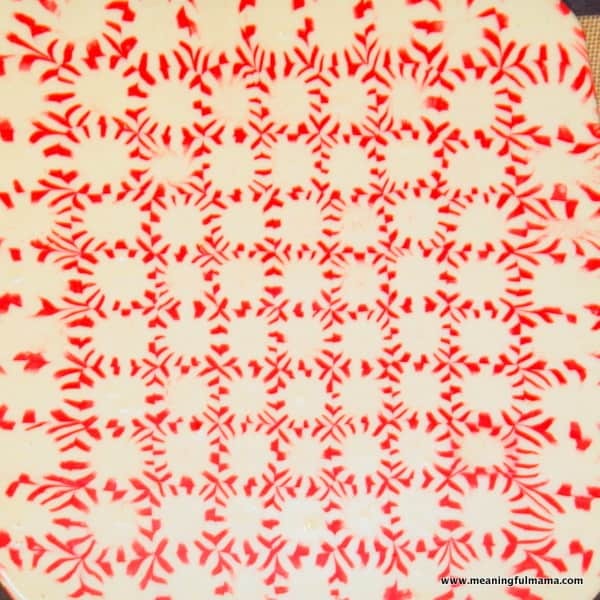 I saw the idea for a peppermint tray at a link party, but I couldn’t find the site I had seen it, so I’m sorry that I am not linking back. I like to link back when I can. 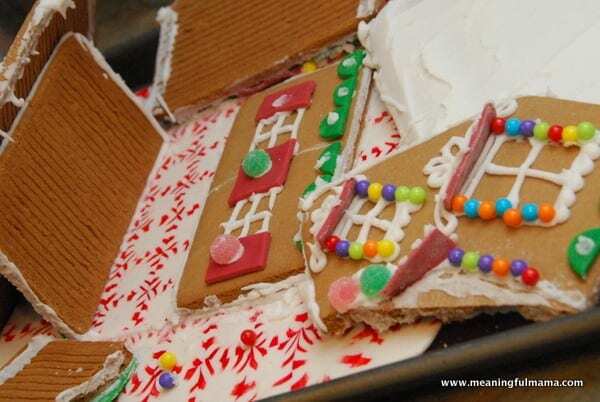 I loved the idea of using the peppermint tray for the base of a gingerbread house. 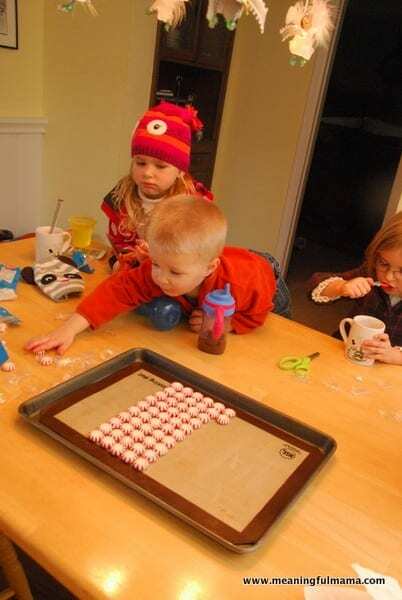 The kids helped me unwrap all of the peppermints and put them in rows on a silicone mat on my jelly roll pan. You can use parchment paper if you don’t have a silicone mat. 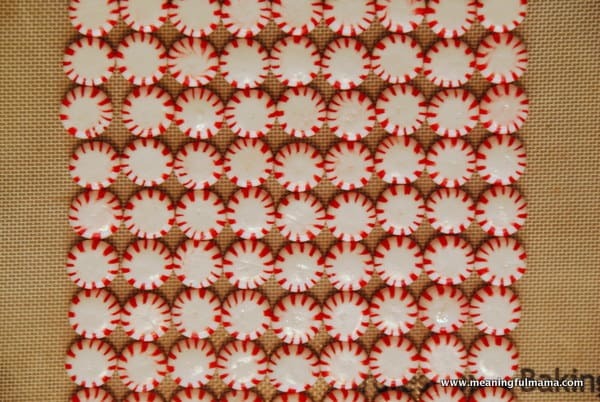 Once your peppermints are all laid out, bake at 375 for 8-11 minutes. I just kept my eye on it until it was done. Let it cool before you lift if from the mat. It reminded me of the homemade lollipop project we did, which remains one of my favorite things we have done. It was now time for us to move onto our gingerbread house. I did what bloggers probably aren’t suppose to do and bought a pre-made kit. I have made the Costco ones in the past. I love the ease. I bought this one at Michael’s. On a side note, we were going to make our gingerbread house yesterday, but the girls were not showing self control, so after our first attempt, I put it away and said they could have another chance later. When they were still not obeying, we postponed it until today. They learned. I decided to try something new this year. I had them decorate the sides before we built the house. I have felt like gravity was always working against us, and we needed to sit and hold things in place forever. We did one side at a time and let it dry before assembling the house. I think this is a really good technique. This was a Wilton gingerbread house that came with fondant. 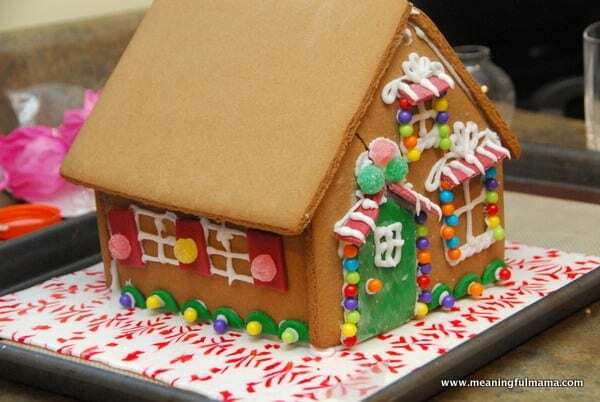 I loved the thought of including it on a gingerbread house. 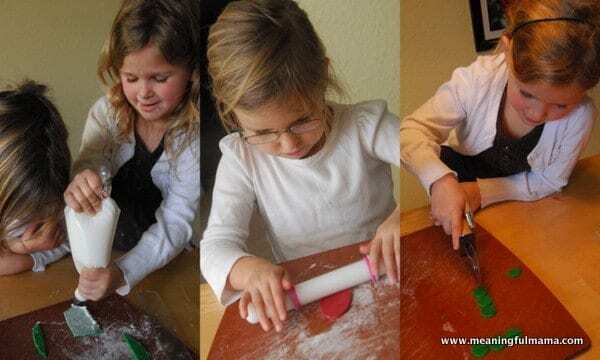 If you have never worked with fondant, this is a great exposure to the medium. …before it fell apart. The kids took this way better than I did. They probably had no idea because I felt like I hid it well, but I was fairly annoyed that it fell apart. You can see the crack in the front originally. I accidentally leaned on it and cracked it after warning my kids how fragile it is and how they needed to be careful. I tried to glue it back together with the frosting. I put the roof on. I think I didn’t let it dry enough before I started spreading the frosting on the roof. Either that or the pre-made frosting that was in the kit wasn’t very strong. Everything just started to fall apart. The kids were just excited that I would let them start to eat the candy at that point. Oh well…next year. I’m still doing the peppermint tray in the future. Great addition.